Buy the online course and get started now! You’ll be teaching your dog in the comfort of your own home with Sarah’s online dog training course in no time. Here’s a reminder of what you’ll get as part of the course. All dogs need training! A trained dog is allowed more freedom, is more likely to accompany you out and about and will be welcome by your friends and relatives as a part of your family. Without training, dogs bark, dig, jump up, run off, chew, steal, and create havoc… the dog is then blamed for being naughty or ‘dominant’ when really it’s just acting like a dog. Great for building confidence in rescue dogs. 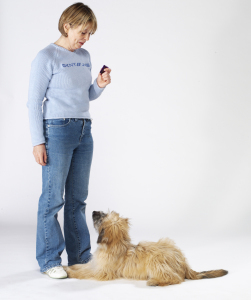 Sarah’s online dog training course is designed to take you quickly from one step to another in training your dog. The methods are kind and ethical, the results are exceptionally fast, and they stick. Sarah’s methods are suitable for all dogs, no matter what breed, type, shape, size or age. Puppies and re-homed dogs respond brilliantly to the gentle, consistent techniques. You’ll be amazed at what your dog can achieve in just four weeks. The concept is simple – nearly all relevant dog training occurs in your home or when out on walks – not in a dog training class. While going to a local class can be great for some, the essential component of training is that you – the owner – learn how to train your own dog in your own home. This has major benefits: You know your dog better than anyone. You know what he likes and dislikes and can focus on the areas of training that you need most. You can work at your own pace, when and where you choose, and train your own dog simply and successfully, building your relationship and bond with him along the way. It’s like having a professional trainer in your own home. Unlock your dog’s genius today! The concept is simple – nearly all relevant dog training occurs in your home or when out on walks – not in a dog training class. And what could be more comfortable than you teaching your dog with an online dog training course? While going to a local class can be great, not everyone can reach a branch of the Clever Dog Company or has time to attend classes as regularly as they should. Learning to teach your own dog with online dog training has major benefits: you know your dog better than anyone, and can work at your own pace, when and where you choose. With Sarah’s online course you can train your own dog simply and successfully, making sure that the training is done where it matters most. Here’s a taster of just one of our video training lessons. In the actual course, this is accompanied by written instructions and photos to help you train your dog easily and quickly. All this in only four weeks! Teaching your dog to pay attention to you, indoors and out. Teaching your dog to rollover! Teaching your dog to give a paw! End of course test. Take our five-minute test and rate your clever dog’s progress! Online dog training works very simply. Once you have signed up, you will be sent video tutorial lessons designed to be followed for four weeks (or at your own pace) which you access through the website. We love to hear about your dog - so please tell us about him or her below. We also need your details - and most dogs aren't so good with keyboards, so you'll need to do the typing! Are you experiencing any kind of difficulty with your dog?